Power Stone meets Rival Schools when an academy full of hormonal, wide-eyed teenagers slug it out to see who has the strongest quirk. No idea what I’m talking about? Then clearly you have never owned a Dreamcast or watched the popular Japanese anime series, My Hero Academia. No need to worry though, as this 1-on-1 arena brawler is easy to pick up and a blast to play once you mould into the easy-to-learn universal control system. Now, I’m not going to spend half the review banging on about background knowledge on how lead character, Deku inherits his super-human abilities from the world’s greatest hero, All Might. Obsessed Otaku kids will be fully aware of the anime’s legacy and for those who aren’t familiar probably won’t even care. However, what I will tell you is that My Hero One’s Justice is quite the different fighter than the already healthy catalogue of brawlers that the Nintendo Switch currently has to offer. In a loose but still similar fashion to Capcom’s classic Power Stone, fights take place in an open arena where each combatant is given the full freedom to run around and scream at each other. The basic fight mechanics consist of a single spammy target-combo that can conclude into one of two special attack buttons. Leaning the stick in combination with either of these actions will change the properties of their outcome. For example, tilting the stick with any of the two special buttons will alter the move completely. While combing the stick with the opening target-combo will set off a counter-attack that will absorb the hits of the opponent without breaking the flow of animation. There’s nothing in the fighting system in regards to execution that really gets any more complicated than simply pairing up actions. Simultaneously combining a standard guard with the target-combo will unleash an unblockable attack to take your defending opponent by surprise. Mixing the guard up with a specific special move will set off a damaging Plus Ultra attack depending on how many bars of meter your character has. In stirring everything together when the right opportunity arises, you have a simple, yet somewhat effective game of rock, paper, scissors albeit much more mental and far more eccentric. However, what draws everything together is how each character navigates around the arena. While the fighting system is incredibly simple by nature, creating your own opportunities and playing mind games work as a result of handling 3D space. Some characters can sprint around the place for days on end in comparison to others who may only be able to dash small distances in shorter bursts. Having access to a double-jump for each fighter will see to it that the freedom of movement and evasion is flexible enough to work in favour of navigational tactics. Holding the sprint action while airborne will hone-in and dash directly towards your opponents like a Dragon Ball Z game. Yet unlike those titles, you are not fully committed to seeing a dash all the way through. You can actually break the rhythm by jumping back mid-dash to allow your next move to become a little harder to read. Where the fighting system keeps things approachable in relation to reading each other’s actions, is down to a colour-coded system in place to give the player a heads up when to respond. Counter attacks will turn your character yellow and unblockable attacks turn them red. These become valuable telltale signs when things begin to get a bit more chaotic. Once more, a counter can be countered and an unblockable can be evaded given that you respond to the warnings fast enough. My Hero One’s Justice itself provides a fairly decent explanation on how everything works, although, it’s more down to the player to figure out how to respond to each situation based on which fighter you choose. As far as the core gameplay plays out, My Hero One’s Justice is a fun, manic medley of chaos and combustion. The fight can transition from ground to the air and across the walls and ceilings while accompanied by a camera that does its best to capture the action. Granted, things can get messy the more mental the fight becomes, but My Hero One’s Justice clearly isn’t trying to play up to the elite competitive scene. There’s still room to style it out and experiment with combo opportunities with both a basic and manual control option to play with. Just don’t go in expecting a sheer level of technical depth and frame-tight endeavours that a more serious fighter has to offer. One important feature (which can be turned off in local play if you wish) is the use of two assist characters to accompany your hero or villain. You cannot tag them into play like a team arcade fighter but they do come in handy during sticky situations. Eating a combo can be interrupted with an assist’s interference and dishing out damage can be complemented with an assist attack. Each has a cooldown period met with a meter that takes time to fill up once spent. This denies the temptation to abuse the mechanic and the state of their use during gameplay as their meter does not reset into the next round. As a result, the aid of the assists can then become a vital component in strategic gameplay. It’s a cool feature that can turn the tables of a fight if they are employed well enough. As good and exciting as the visuals can come across in motion, there are some technical discrepancies that can hinder the flow. There were times where the frame-rate can hit single digits during the more chaotic moments. This would usually happen if both players have their assists out, or too many things are happening on screen at once. Combine that with a camera that’s trying its best to keep up can lead to the graphics engine having a bit of a meltdown. The thing is, these fairly infrequent moments, to me at least, don’t look to appear to be the result of an underpowered console. As nice as the graphics can come across in movement, the architecture of it all is very simplistic. Environmental props that get destroyed as a byproduct of pent-up teenagers letting off steam with God-like abilities have the gravitational pull of inflatable furniture. While the low textures and clipping on flat backgrounds can leave a little more to be desired. None the less, the 15 stages found in My Hero One’s Justice are fun enough to fight in with some fairly decent damage aftermath effects. Carpets and walls will tear and crumple behind the characters like a slug trail of disaster. Some stages have a SoulCalibur-style ring out setup which can be exciting and tense when trying to stay off the ground – or anti-climatic given the obvious circumstances and outcomes that accompany such a feature. The design of the characters does look like they have had plenty of care and attention paid to them though. Every combatant in the roster looks very faithful to their anime counterpart with plenty of cool and dynamic animations to accompany each one of them. As far as single-player content goes, predictably for a fighting game, there’s not a great deal here to write home about. The story mode is basically a generic text adventure with a very slight use of choreographed in-game action scenes thrown in. You pretty much read through the drama of the story with Japanese-only voice acting and then battle mindless opponents until the story transitions to the villain’s point of view. If you’re a fan of the anime, you’d probably be best off sticking with the original source to feed your narrative fix. What makes the story a bit more of a chore to endure is the rather long load times that are rampant across the board. They are not game-breaking by any means, but long enough for me to start feeling impatient between matches. Other than the story, there’s a mission mode where you can climb a flowchart fighting opponents under certain required conditions. There’s also a customisation menu to give your favourite character a bit of a personal makeover with accessories earned or purchased with in-game currency. Other than that, you are pretty much left with a basic training option and a bog-standard arcade mode that doesn’t allow for the player to raise its difficulty. The default challenge is moderate, but easily overcome once the basic gameplay mechanics are learned. Despite the single-player content being rather underwhelming, fighting games are never usually very good at catering for the solo player. They are meant to be played with others, and as a couch competitor, My Hero One’s Justice is still a hell of a lot of fun to mess with. I’ve banged in a good few hours into versus mode with my teenage son who happens to have a somewhat natural flair for fighting games (although, admittedly, he can get very salty when his old man kicks his arse). There was plenty of drama, upsets, complaining and heroic comebacks from us both which is always a good sign of a fun throwdown. Not everybody has the privilege of owning a child that they can bully for their own amusement. It’s a good job then, that modern technology allows for friendly worldwide competition from the comfort of your own home. I managed to get a decent amount of matches a day or two before My Hero One’s Justice hit western shelves. The majority of players I faced seemed to be either Japanese or Americans with imported copies. The street date in Asia broke out back in April, so many players that I faced were already high ranked and had a good handle on the arena brawler. Besides a choppy intro and some input lag, fights for the most part surprisingly ran pretty smoothly. Some were actually bang on, which may be down to the competition closer to home possibly getting hold of an early delivery. I gathered this to be the case due to their score rank being similar to my own. I was personally sceptical on how My Hero One’s Justice would play online, but my final test before review in the early hours of release day seemed to show a promising start. The online mode features the ability to “Like” a match against an opponent similar to gaining kudos from social media. Other than that, it’s just the standard ranked, unranked, create or join a lobby options, along with a player rank scoreboard. It would have been nice to see where in the world the player I was facing was from, and, more importantly, a best out of three salty runback feature to secure a concrete victory. After every single battle, I was forced to search for another opponent which can lengthen the dead space between waiting between bouts. Fights did come in thick and fast though, which is quite promising considering the game wasn’t officially out during the majority of my testing. For those who want to buddy up with friends that can’t be bothered to meet up in person can also set up a private, password-locked lobby. Unfortunately, by the look of things, these lobbies only tailor for no more than two players at once. My Hero One’s Justice looks to be a promising start to what feels like a new kind of brawler. While the Dragon Ball Xenoverse series and the upcoming Jump Force play around in 3D space, there’s something about this one that feels different and shows a potential to evolve in a sequel. It’s the only arena brawler that I’ve played in a long time that somewhat reflects the Power Stone series besides the weapon-based environmental tools that were found in the long-lost Capcom classic. 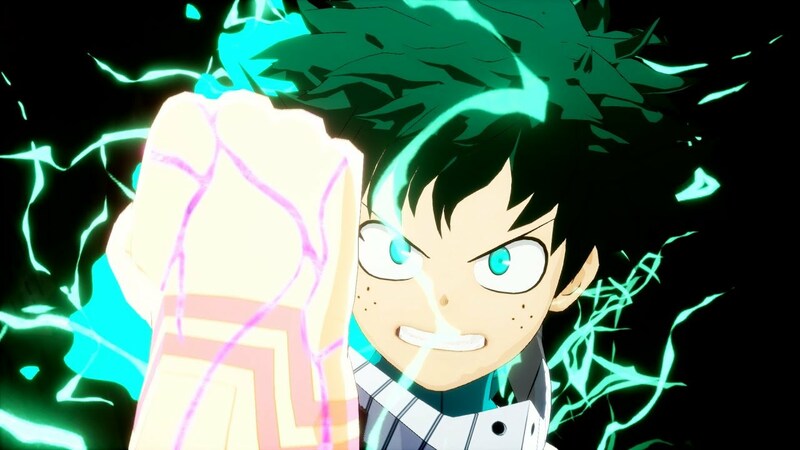 My Hero One’s Justice has a much more flexible fighting system in comparison, but there is a lot of room for improvement that could have been made to flesh out the game’s potential.